When we visit our family in Dallas, Texas we ALWAYS make at least one stop at the Central Market on 5750 East Lovers Lane. The digital below gives you some idea as to the size of the facility—its is HUGE. Everything from soup to nuts, all fresh daily, with an amazing verity of choices for every want and need including ethnic. In this case, a picture or pictures, are better than a thousand words so this post will be pictorial in nature. I do not think you will regret the digital visit. Here we go. The outside is not very dramatic. Pretty much “plain Jane” as it were but wait until you see the inside. No way we start shopping without taking our grandson. As you can see, he is driving the bus. If variety is the spice of life you are in “tall cotton” when you first visit the vegetable section. This is the very first area you come to when you enter. The picture below does not do the area justice. There are three additional long tables and one shorter table loaded with anything you might want or need including vegetables I have never heard of much less eaten. The citizens of Dallas represent a very diverse culture so Central Market caters to those cultures. Same way with fruits. You name it—they have it. Again, four tables of fruits neatly arranged and labeled to provide any customer with a superb selection. All fresh although there is a frozen fish section in coolers located within the department. $26.99 per pound for lobster tails. You might also notice the size of the bay scallops. They are absolutely huge. Two sixty (60) foot counters of meat for consideration. If they don’t have it, you done need it. There are even “exotic” meats such as ostrich, buffalo, snake, etc etc. This is one of the most intriguing displays in the store. Each container carries a different consumable. 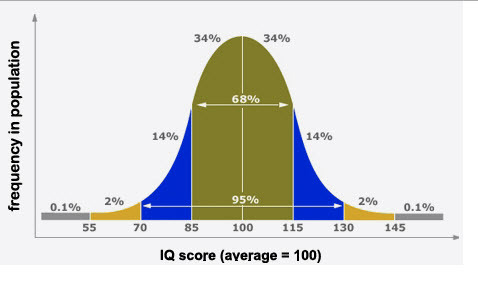 As you can see, there are well over fifty (50) to consider. Again, Dallas is a diverse city and many shop here because they know they can find foods and ingredients common to their upbringing. The various coffees displayed cover the field and come from many many different countries. You can buy the bean or grind in the store. To me, the most impressive section of the Central Market is the great variety of bread they offer. ALL bread, including muffins and pastries are baked at the store on a daily basis. The second most-impressive displays are in the Cheese Department. Again, if they don’t have it you don’t need it. With bread and cheese, you have to have wine and of course they do. Take a look. We may as well finish with dessert. Take a look at the selection below. Mot Hai Ba is located in the Lakewood Neighborhood of Dallas at 6047 Lewis Street and is one of the many gourmet restaurants in the city of Dallas. When I think of Dallas I think of brisket, BBQ, ribs, flank steak, etc. I do NOT think of North Vietnamese cuisine—at all. Not at all. Quite frankly, I’m not too sure I have ever eaten Vietnamese food and I do not think we have Vietnamese in our “neck of the woods”. When I saw the “North Vietnamese Cuisine” sign on the door I was a little concerned about finding a plate I could eat without calling the fire department. Our daughter-in-law took my wife and me to Mot Hai Ba last night for dinner. It was a marvelous surprise. As you walk down Lewis Street to the restaurant, you first see a fairly small terrace that can accommodate four tables and about twelve or fifteen people. Fortunately, the weather last night was sixty-one degrees with a cloudless blue sky. We sat outside. I went inside to take a look and discovered the area you see in the following photograph. Once again, not too large but certainly a very cozy atmosphere. I was very interested in the table settings. As you can see, at each place was properly positioned chop sticks, small plate, napkin and one water glass. No chairs, just padded stools. Very small bar area with minimal seating for customers. This is a place you eat and not hang out and drink. That fact became very obvious at first glance. Now for the food. I have copied the menu below from their web site due to my inability to capture the entire menu and provide readability. Please forgive the segmented portrayal. I had braised scallops on an eggplant sauce that was out of sight. I love scallops but not a real fan of eggplant but this was absolutely marvelous. Truly a great meal. I don’t know if you travel to Dallas but if you do, please check out một hai ba. You will not regret this one. For the past two weeks my wife and I visited our youngest son and his family in Dallas. We were on a mission—all three had the flu at some time during the previous two weeks so we were making efforts to get them back among the living. Our main purpose was caring for and watching our nine (9) month old grandson while mom and dad recovered and went back to work. We had a little free time on the Friday prior to our leaving for home in Chattanooga so we stopped in for a late lunch at the “Lakewood Smokehouse”. This turned out to be a very pleasant surprise. As you know, Texas is known for brisket. In my opinion, the best does come from Texas. Our waiter (shown in the picture below) was GREAT and had all the answers. The entire staff made us feel right at home and were very accommodating. As I mentioned earlier, the Lakewood Smokehouse was a very pleasant surprise for us. I can definitely recommend it to you the next time you are in big “D”. Just ask for the Lakewood Shopping Center. You can’t miss the sign. Last week my wife and I visited our youngest son now living in Dallas, Texas. (It’s really nice to have them gainfully employed and off the “payroll”.) He is an MIS graduate from the University of Georgia and works for AT&T in their 401K area as a quality control specialist. Monday was a tough day for him with multiple meetings so we decided to take the day and visit Dallas Cowboy Stadium. Let me mention right now that I am a die-hard Chicago Bears fan and I went only to observe and not to praise. 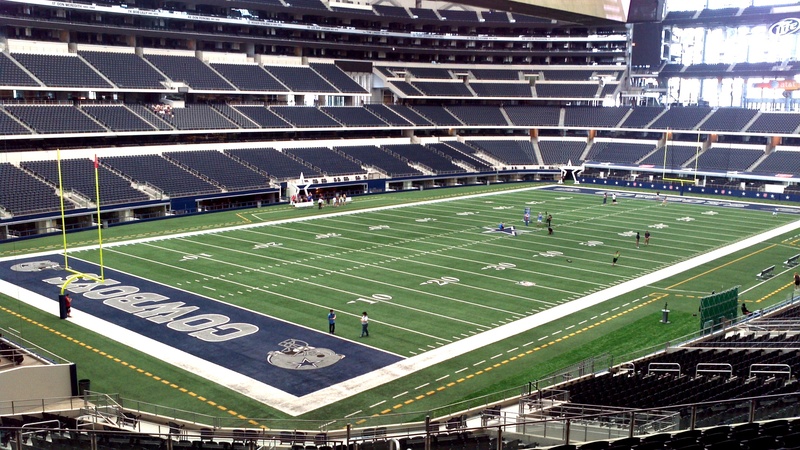 The stadium is located in Arlington about forty-five minutes west of Dallas. Fairly easy drive even with traffic. I was not disappointed. It is an absolutely fabulous stadium. The architecture is stunning; the engineering is remarkable. I’m not saying it is one of the ten wonders of the modern world, but maybe eleventh. What I would like to do now is give you an engineer’s viewpoint relative to the structure with several observations along the way. Let’s look at the stadium itself. The picture does not really do justice to the size or basic configuration. By that I mean you cannot tell the walls are canted outward 14 degrees to enhance the mechanical design and support the massive movable panels located in the dome itself. 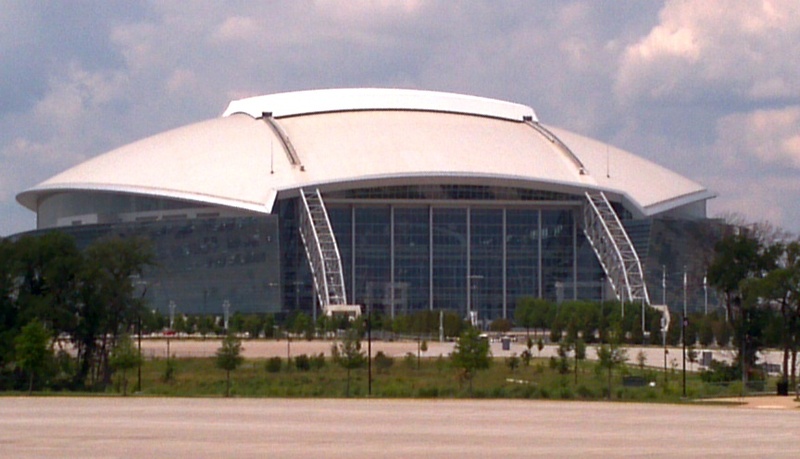 This structure replaced the Texas Stadium which opened in 1971 and served as the Cowboys’ home through the 2008 season. The new stadium was completed on May 27, 2009 and seats 80,000, making it the third largest stadium in the NFL. The maximum capacity, including standing room, is 110,000. The Party Pass (open areas) sections are behind seats in each end zone and on a series of six elevated platforms connected by stairways. The cost for “standing room only” is about $29.00 with sell-outs every game. The original estimated cost to build the structure was $650 million dollars but the actual costs was $1.15 billion, making it one of the most expensive sports venues ever built. The city of Arlington, the state of Texas and the NFL contributed to overall financing which made construction possible. It is the largest domed stadium in the world, has the world’s largest column-free interior and the 2nd largest high definition video screen which hangs from 20 yard line to 20 yard line. The screen assembly is absolutely massive. Our tour guide indicated that when the screen was positioned, the supporting beams dropped four inches due to the weight. (The maximum calculated drop possible was eight inches.) 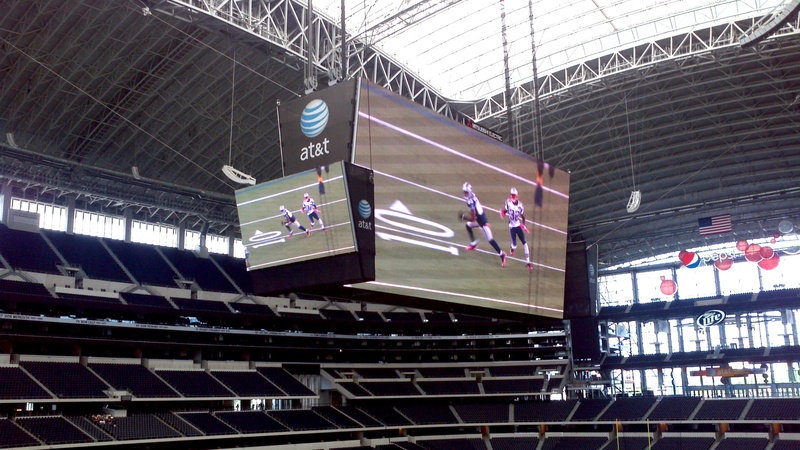 These screens hang ninety feet above the playing field. Two video screens facing the sidelines each measure 72 feet high by 160 feet wide, roughly equivalent to 4,920 52-inch flat panel television screens. LEDs serve as individual pixels for viewing and, of course, they all work in unison when operating. That alone is an engineering marvel in my opinion. During a game with the Tennessee Titans, the very first year, the Tennessee kicker actually hit the screen during a forth-down punt. This generated some concern but not enough to necessitate any real changes to elevation or positioning. In addition to the magnificent screen, there are 3200 HD TVs located throughout the stadium for the benefit of the fans. The facility can also be used for a variety of other activities outside of its main purpose (professional football) such as concerts, basketball games, boxing matches, college football and high school football contests, soccer matches, and motocross races. We were told that the previous week, there were three weddings, all on the fifty yard line and right on the Texas star. That’s devotion. Total Yards, Concrete: 200,000 cu. yds. Size Moveable Roof: 661,000 sq. ft.
Ea. Mechanized Roof Panel: 63,000 sq. ft.
Max. Roof Height: 292 ft.
Video Score Board Size: 20,000 sq. ft. The field you see below is actually three stories DOWN. It’s subterranean. 96,000 truck loads of earth were removed prior to starting the foundation work. Can you imagine the time it took to remove and haul that number of loads? The “carpet” is laid in ten yard widths with the yard-line markings stitched into the backing then adhered onto one inch open cell foam padding. There is no “painting” on the surface at all—just stitched into the composite. I thought this was very interesting. If you look closely, you can see two stars in the picture. One indicating the Cowboys’ locker room and one indicating the Cheerleader locker room. The visiting team does not get a star to run through. I might mention the wood used for the individual lockers is made from the same material as the wood trim in Ms. Jerry Jones’s Bentley. The stadium’s 660,800-square-foot retractable roof can be open or closed, depending on weather conditions. It takes 12 minutes to open or close each roof panel and the roof opening is visible from an elevation of five miles. The roof is supported by two enormous arches, soaring 292 feet and weighing 3,255 tons each. Please go back and take a look at the first picture of the stadium and you can see the huge beams supporting the roof panels. The roof isn’t the only thing that can be opened when the weather is nice. Cowboys Stadium has the largest retractable end zone doors in the world, measuring 120 feet high by 180 feet wide and made of glass. You can see one end zone section below. These doors allow entry for special events, such as “monster truck” demonstrations, motocross races, etc etc. 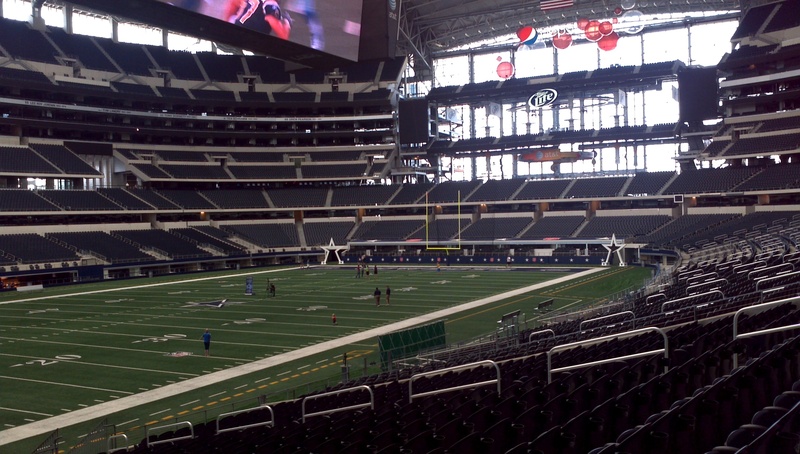 I certainly recommend that if you are in the Dallas area you take a look at the Cowboy’s stadium. We took the self-guided tour but there are audio tours and tour guides for visiting groups. It truly is an engineering marvel.